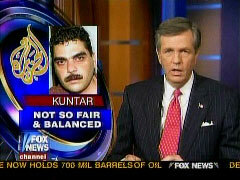 As previously reported by Newsbusters, ABC's World News with Charles Gibson, CNN's The Situation Room with Wolf Blitzer, and FNC's Special Report with Brit Hume had presented more information to viewers about Kuntar's history and hero status in Lebanon, after his release by Israel as part of a prisoner exchange deal, than did the CBS Evening News with Katie Couric or the NBC Nightly News, substitute hosted by Ann Curry. FNC's Morton Kondracke summed up the matter on the July 17 Special Report: "This is such a lopsided deal, and what's most disgusting is that the Lebanese performance, tens of thousands of people turning out to welcome home a terrorist who had killed a policeman, a civilian, and then bashed in the head of the civilian's four-year-old daughter. And he's being welcomed home as though he's a national hero, with the president there, the prime minister there, the speaker of the parliament. This is supposed to be an ally of the United States, Lebanon. What it indicates is that Lebanon, that Lebanese politics is now owned by Hezbollah, which, in fact, it is. I mean, they went into the streets, they scared the Lebanese army back. They decided to pull back when they could. But they have veto power over whatever the Lebanese government does, you know. Lebanon is close to being lost." BRIT HUME: And, finally, the Arab news network Al-Jazeera celebrated the birthday of released Lebanese terrorist Samir Kuntar with a cake and fireworks. The Middle East Media Research Institute reports that Kuntar, who shot an Israeli child's father in front of her, and then beat her to death with his rifle back in 1979, was given a hero's welcome on the network. One interviewer said, quote, "You deserve even more than this. I think that 11,000 prisoners, if they can see this program now, are celebrating your birthday with you. Happy birthday." Kuntar, who was part of the Israel-Hezbollah prisoner swap last week, was then presented a cake and a collage of photos, including one of him and the Hezbollah leader Hassan Nasrallah. And as Kuntar cut into his cake, the network set off fireworks.